Tank Details: 48,12,17. er... glass. The Fish: 1 angel, 2silver sharks,1 red tailed black shark, 3 black widows, 1 red barb, 1 leopard plec, 1 giant plec, 1 convict, 1 skunk botia, 1 kuali loach, 2 boesmans rainbowfish, 1 clown knife fish, 1 silver doller and a striped raphael catfish. 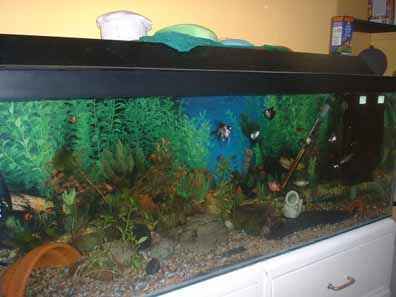 Comments: fluval 4 filter and a big bright light.